Brett Arends at Marketwatch has an interesting story titled 'The Biggest Lie About U.S. Companies'. While it is often touted (accurately) that U.S. corporations have record amounts of cash on their balance sheets ($2 trillion-ish), people are not looking at the liability side of the balance sheet, which apparently has also surged. Now on the plus side with the Bernank punishing savers and driving down government rates, a flood of money seeking any yield has gone into the corporate market; this has helped companies refinance that debt at very low rates - even the junk market has seen a boom the past few years. Hence that debt is quite low in yield - but it is still there. Keep this in mind each time we hear about the record amount of cash on corporate balance sheets. You may have heard recently that U.S. companies have emerged from the financial crisis in robust health, that they've paid down their debts, rebuilt their balance sheets and are sitting on growing piles of cash they are ready to invest in the economy. ....top companies "have accumulated an astonishing $1.8 trillion of cash," leaving them in the best shape, by some measures, "in almost half a century." It all sounds wonderful for investors and the U.S. economy. There's just one problem: It's a crock. American companies are not in robust financial shape. Federal Reserve data show that their debts have been rising, not falling. By some measures, they are now more leveraged than at any time since the Great Depression. You'd think someone might have noticed something amiss. After all, we were simultaneously being told that companies (a) had more money than they know what to do with; (b) had even more money coming in due to a surge in profits; yet (c) they have been out in the bond market borrowing as fast as they can. Does that sound a little odd to you? A look at the facts shows that companies only have "record amounts of cash" in the way that Subprime Suzy was flush with cash after that big refi back in 2005. So long as you don't look at the liabilities, the picture looks great. Hey, why not buy a Jacuzzi? According to the Federal Reserve, nonfinancial firms borrowed another $289 billion in the first quarter, taking their total domestic debts to $7.2 trillion, the highest level ever. That's up by $1.1 trillion since the first quarter of 2007; it's twice the level seen in the late 1990s. The debt repayments made during the financial crisis were brief and minimal: tiny amounts, totaling about $100 billion, in the second and fourth quarters of 2009. Remember that these are the debts for the nonfinancials — the part of the economy that's supposed to be in better shape. The banks? Everybody knows half of them are the walking dead. Central bank and Commerce Department data reveal that gross domestic debts of nonfinancial corporations now amount to 50% of GDP. That's a postwar record. In 1945, it was just 20%. Even at the credit-bubble peaks in the late 1980s and 2005-06, it was only around 45%. The Fed data "underline the poor state of the U.S. private sector's balance sheets," reports financial analyst Andrew Smithers, who's also the author of "Wall Street Revalued: Imperfect Markets and Inept Central Bankers," and chairman of Smithers & Co. in London. "While this is generally recognized for households," he said, "it is often denied with regard to corporations. These denials are without merit and depend on looking at cash assets and ignoring liabilities. Cash assets have risen recently, in response to the fall in inventories, but nonfinancials' corporate debt, whether measured gross or after netting off bank deposits and other interest-bearing assets, is at peak levels." 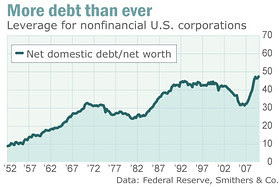 By Smithers' analysis, net leverage is nearly 50% of corporate net worth, a modern record. There is one caveat to this, he noted: It focuses on assets and liabilities of companies within the United States. Some U.S. companies are holding net cash overseas. That may brighten the picture a little, but the overall effect is not enormous, and mostly just affects the biggest companies. But why is this line being spun about healthy balance sheets? For the same reason we're told other lies, myths and half-truths: Too many people have a vested interest in spinning, and too few have an interest in the actual picture. Journalists, for example, seek safety in numbers; there's a herd mentality. Once a line starts to get repeated, others just assume it's correct and join in. Wall Street? It's a hustle. This healthy balance-sheet myth helps sell stocks and bonds. How many bonuses do you think get paid for telling customers the stark facts, and how many get paid for making the sale?